ZenVentures is an online and offline entrepreneurship ecosystem created and managed by And Africa Co., Ltd. We support all types of startups, investors, and professionals by providing a platform to connect, raise capital, find talent and be inspired. Companies, investors, entrepreneurs or job seekers can register to our platform to connect with each other in a curated ecosystem that ensures safety, reliability and support. Founder & CEO of And Africa Co., Ltd. He focuses on creation of African startup eco-system. He really like to communicate and support African young entrepreneurs in terms of fundraising, client acquisition, mentoring, business skill transfer, etc. He used to work at major consulting firm like Deloitte for 5 years, and found his first company exporting secondhand car from Japan to Africa. And then, found And Africa to enhance African young leaders. Executive: Building the African entrepreneurship ecosystem one city at a time. Graduated from Pretoria University (Chemical Engineering), Gordon Institute of Business Science (Post-Graduate Business Administration), Wits Business School (Entrepreneurship and New Venture Creation Masters). He worked with AT Kearney and RIIS in strategy and innovation advisory. He then founded " DUYO " to support African entrepreneurs. Working on developing local entrepreneurship ecosystems throughout Africa based in South Africa. Executive: Driving investments into emerging markets. Graduated from University of Cape Town (Political Economics), Oxford University Graduate School (Economics). He worked with PwC in Cape Town before joining the Japan Exchange and Teaching Program (JET). He’s recent work was in commercial legal advisory with Davis Polk & Wardwell. And Africa is a consulting and investment advisory firm located in Tokyo, Japan with a branch office in South Africa. Our vision is to be a bridge between Japan, other developed nations, and African countries. Japan has knowledge, technology and capital, but a declining population and stagnating economy. African countries are dynamic and growing rapidly, but lack jobs, technology and capital. We aim to match the needs of both regions to create sustainable and innovative partnerships. 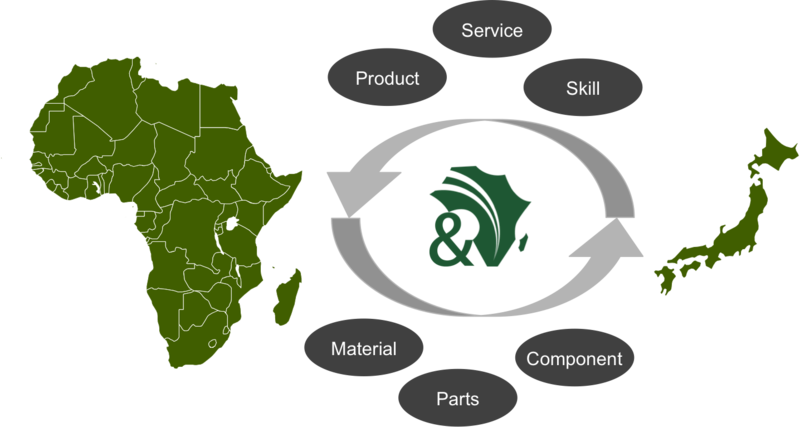 And our mission is to promote industrialization and job creation in Africa. And also to create exponential growth opportunities for Japanese companies, investors.